Joined by Alderman Fredrinna Lyle (6th Ward), Gillespie Elementary School principal Michelle Willis — joined by more than 100 Gillespie teachers, parents, students, and community supporters — told the Chicago Board of Education's hearing on the proposal to "turnaround" Gillespie and turn it over to AUSL (the Academy for Urban School Leadership) that Gillespie is already well on the way to being changed for the better and that CPS should leave the school alone to do the work it is already doing well. 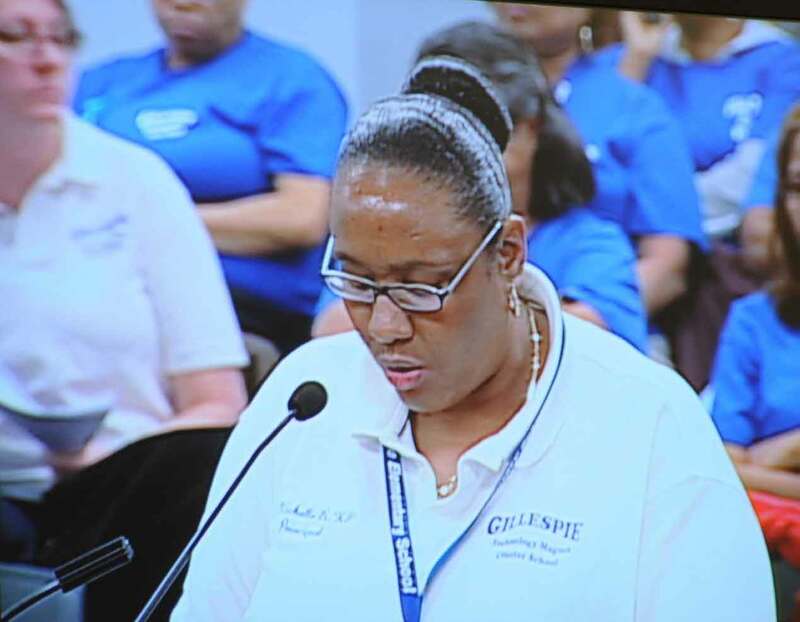 Above, Gillespie Elementary School Principal Michelle Willis tells hearing officer Fred Bates and two members of the Board of Education (Peggy Davis and Alberto Carrero) that Gillespie has successfully transformed itself and should not be on any list to be subjected to so-called "turnaround" by the Academy for Urban School Leadership (AUSL). Substance photo by George N. Schmidt.Principal Michelle Willis, who was appointed by the Board of Education to be principal of the school after the removal of the former principal in March 2007, outlined the school's achievements in a lengthy summary, and presented the Board's hearing officer, Fred Bates, with a briefing book. Willis, like most of the principals who have testified since the hearings began on January 28 of this year, also noted that most of the data provided by CPS to justify the attack on the school, noted that the data were not true. Since CEO Ron Huberman introduced what he called his "Performance Management" plan to the Board of Education at the December 16, 2010 Board meeting, the data provided for management plans has been revealed time after time as corrupt and corrupted. 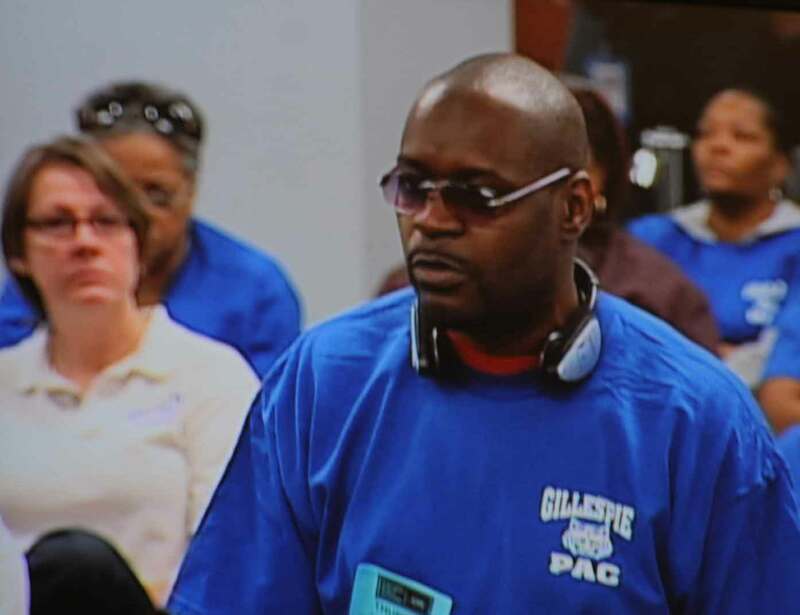 Gillespie Elementary School parent and Local School Council member Anthony Stallworth (above) told the hearing officer how the school was in chaos prior to the arrival of Principal Michelle Willis in March 2007, and how quickly the principal changed some of the most significant problems in the school. Mr. Stallworth described in detail how the changes were made over time, so that within a year the school's morale had improved, the children felt safe, and even some of the children who had enjoyed the earlier chaos became appreciative of the new opportunities. Substance photo by George N. Schmidt. The Gillespie hearing was just the latest example of a school pointing out that what CPS officials think they know from their version of "data driven management" has nothing to do with the reality of the real children and real adults in the real school they are trying to describe in their computer spreadsheets, graphs and charts. A highlight of the hearing was the testimony of Alderman Fredrenna Lyle (6th Ward) who warned the Board not to continue privatizing public education. 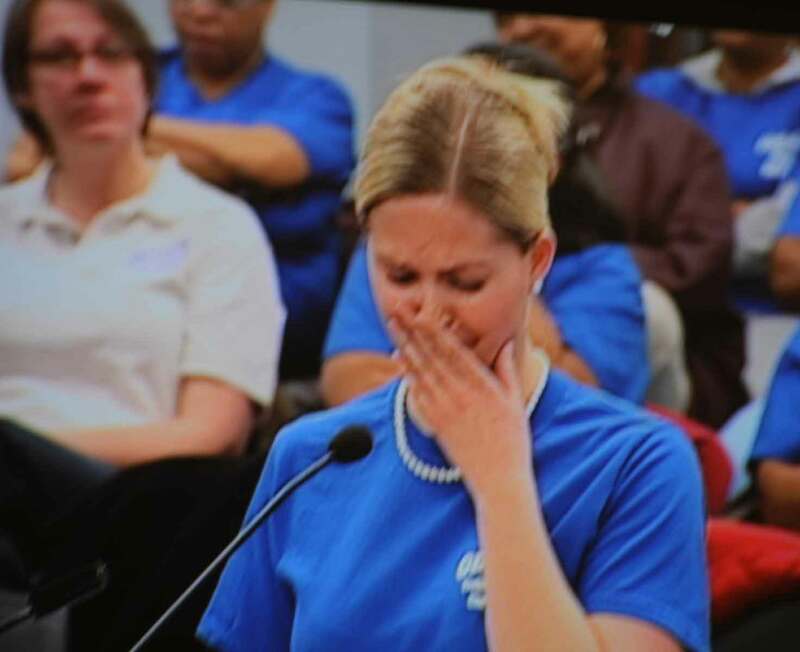 "We should not outsource education," Alderman Lyle told hearing officer Fred Bates, who had smiled and reminded her that she was his alderman. Because the hearing officer once again allowed the Board of Education to present its "case" for nearly an hour at the beginning of the two-hour hearing, many of those who signed up to speak were cut off when the hearing was adjourned precisely at 7:30 p.m. Chicago Teachers Union President Marilyn Stewart (above) spoke, but the union's Recording Secretary Mary McGuire was not allowed to speak. Nor was former CTU President Deborah Lynch, who had also signed up, nor Substance editor George Schmidt, who had prepared testimony entitled "Garbage In Garbage Out -- Ron Huberman's Rube Goldberg Performance Management Machine". Marilyn Stewart pointed out that the hearings this year, like those in past years, tried to reduce complex human educational problems to irrelevant data sets. Substance photo by George N. Schmidt. A the beginning of the hearing, there were 126 people in the Board chambers prepared to defend Gillespie. As usual, by Substance count, the majority of those people, including the children, were African American. A significant feature of the school closings done by the Daley administration, as Substance editor George Schmidt pointed out during the hearing on Tilton and Marconi schools on February 3, is that the victims of these policies have been black. Substance has not had the time to complete our report, but the following You Tube videos will help readers understand some of what took place at the hearing. 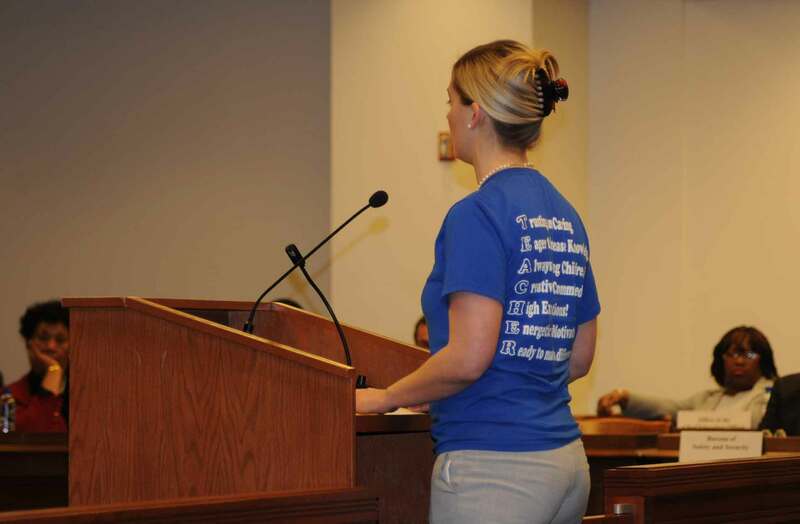 At every hearing, the Board of Education presents its "case" against each school through one of the more than 40 attorneys working in the Board's Law Department. Although the "case" is presented in a way that makes it seem almost like a court hearing, the defendant schools are not allowed to cross examine the witnesses against them or ask for verification of the evidence. As a result, the hearings are actually quasi-judicial kangaroo courts, presided over jointly by the "hearing officer" and the Board Attorney, who presents the case. 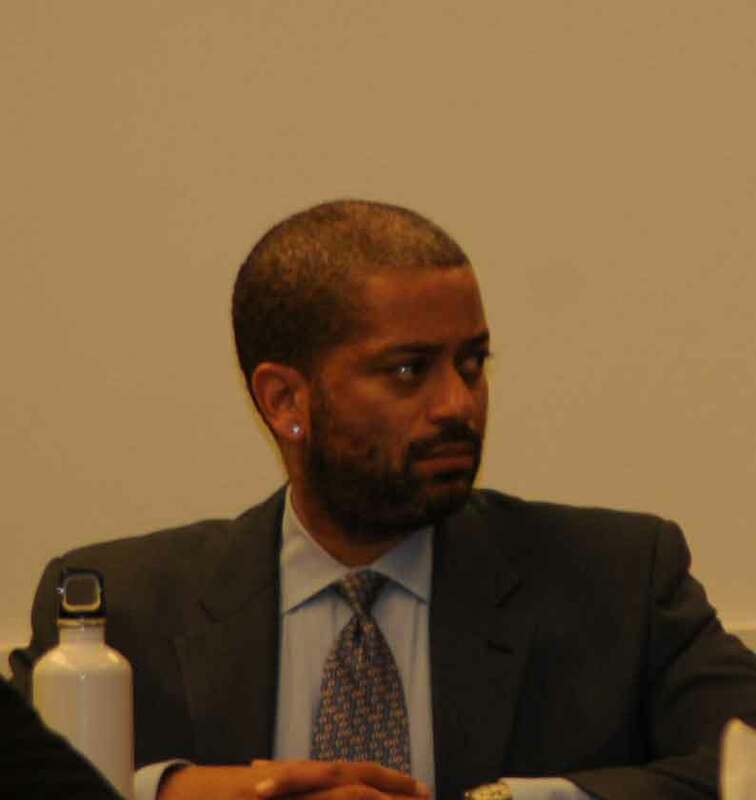 Above, Edward Wong was the person from the Law Department who presented the Board's case against Gillespie on February 4, 2010. Two of the six prospective candidates for President of the Chicago Teachers Union were also present during the Gillespie hearing. 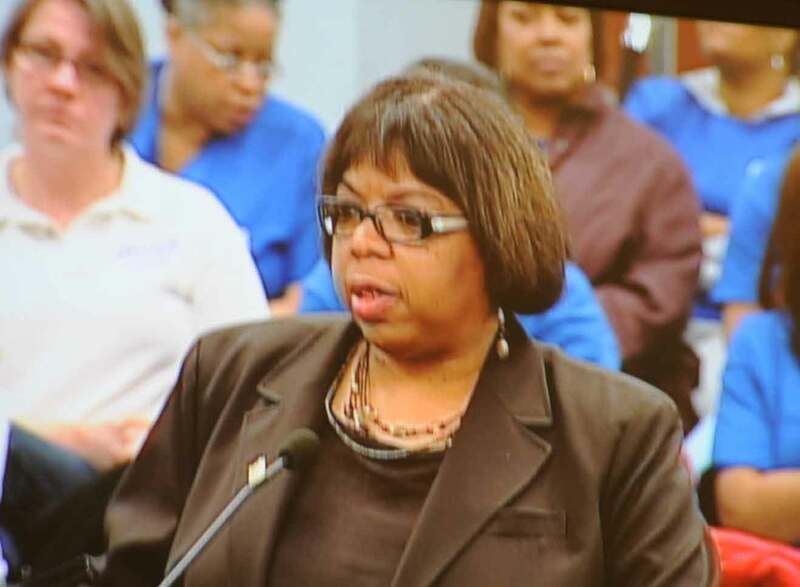 Marilyn Stewart, President of the CTU, was given the floor to speak because of her presidency. Former CTU president Deborah Lynch was signed up to speak, but the time ran out before she was called. Hearing Officer Fred Bates apologized to Lynch and others for the time shortened. The the hearing was adjourned at precisely 7:30 p.m. The following are some of the videos from the Gillespie hearing. Note to our readers. We are still getting the Links function to the URLs below functional, so if you can't get to the links below directly, please just copy and paste the URL into your command line and you can get there (that's how we just did it to test this article). EDITOR'S REQUEST. ANYONE FROM GILLESPIE WHO WANTS TO SEND US THEIR COMMENTS BY EMAIL CAN SEND THEM TO CSUBSTANCE@AOL.COM AND WE WILL PRINT THEM BELOW IN THIS ARTICLE. Good evening. My name is Sarah Koch and I am a second grade teacher at Gillespie Technology Magnet Cluster School. I have proudly taught at Gillespie for the past four and a half years. During the last two and a half years Dr. Michelle Willis has been the principal. It is during that time that I have had the joy, privilege and responsibility to also serve as the athletic director of Gillespie. I can attest to the amazing changes I have seen Gillespie go through during that time in terms of both academics and athletics. I will be focusing on the growth of the athletic programs during the past 2 ‘/2 years. For the almost two years that I was at Gillespie before Dr. Willis became our principal, the only sports that we had were basketball and poms, both of which are winter sports. We had no equipment, uniforms, or administrative support for any other athletic activities. After Dr. Willis arrived at our school near the end of those two years, I was given the opportunity, responsibility, and freedom to lead and grow our athletic program into what it is today. Our yearly 5th through 6th grade athletics program that originally included just basketball and poms has now expanded to include boys cross-country, girls cross-country, double dutch, chess, boy’s track and field, girl’s track and field, boy’s softball, and girl’s softball. All of our programs now have the support, equipment, and uniforms needed to be competitive. The students of Gillespie have family been given a chance, and they have seized that opportunity. Several teams have had athletes that have made it as far as the City Championships, and many of these athletes have even placed. Further, this opportunity has not come at the expense of the students’ education, as each athlete is required to sign and follow a behavioral and academic contract in order to participate. I am only depicting for you a small part of the change, the “turn-around” that has already begun at Gillespie. It would be a disservice and a waste of resources to the community, the children, the city, Chicago Public Schools, and the staff at Gillespie not to allow the change that has already begun to come to fruition. In two short years I have seen amazing growth and potential and know that even greater things are on the horizon. It would be a shame to have all the progress that has been made wiped away and the children and parents at Gillespie having to go back to the drawing board with a new staff. I truly hope that you change your minds about reconstituting Gillespie after what you see and hear tonight. Thank you. EDITOR'S NOTE ON REPUBLICATION USE. This is copyrighted content, news and analysis prepared and published by the staff and supporters of Substance (the print monthly) and Substance News Service (www.substancenews.net). The final edited version of this article and the accompanying graphics were posted at www.substance news.net February 7, 2010, 6:00 a.m. CDT. If you choose to reproduce this article in whole or in part, or any of the graphical material included with it, please give full credit to SubstanceNews as follows: Copyright © 2010 Substance, Inc., www.substancenews.net. Please provide Substance with a copy of any reproductions of this material and we will let you know our terms. Alternatively, please make a donation or take out a subscription to the print edition of Substance (see red button to the right). We are asking all of our readers to either subscribe to the print edition of Substance (a bargain at $16 per year) or make a donation. Both options are available on the right side of our Home Page. For further information, feel free to call us at our office at 773-725-7502. Collegial groups and teachers using this material for class use should simply inform us of the extent of your usage. Anyone utilizing this material for commercial purposes is in violation of U.S. and other international copyright laws. Copyright 2010 Substance, Inc. all rights reserved.